The reporter from the Chicago Tribune that interviewed me did indeed end up writing a story that made use of a quote from me. However, the version with me quoted in it appears in the Kansas City Star, rather than the version in the Chicago Tribune, where the editor must have clipped it out. 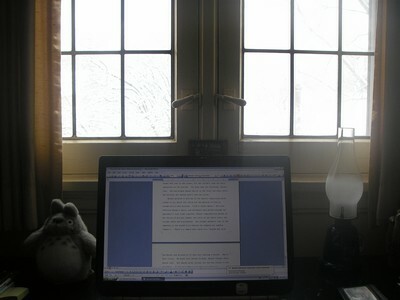 So it’s better for me to stay at home and write, and live vicariously through Greg’s photo travelogue. 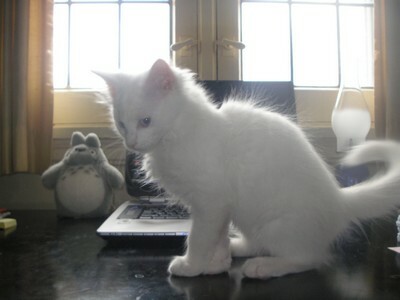 But here is basically what I see every day at my writing desk. 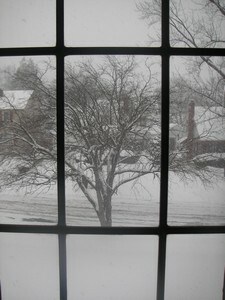 And this is what it looks like outside the window today. And lately this is a new addition to my writing desk, until I shoo them out and shut the door. Totally non-exciting, but it’s where I work. 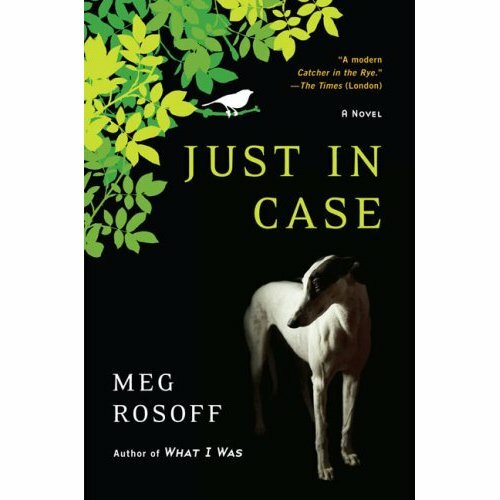 Been hard at work today on novel revisions, but also I finished reading my first Meg Rosoff book. This one was Just In Case, which I enjoyed thoroughly, except for a couple of things that posed problems for me as a reader. The book is about a boy named David Case, who changes his name to Justin on a day when he comes face to face with the near death of his baby brother, and saves him, but in the process is opened up to the reality that at any moment fate could claim him. So he takes on a new identity in order to avoid his fate. The writing is quite magical, full of Amelie-like moments of wonder and beauty, as well as dark moments in which David/Justin’s relationship to the world is severely damaged. He’s introduced to love by an older girl named Agnes, who is totally the type of girl boys like Justin fall for: bright, artistic, and flighty. She’s a photographer, and helps him create his new image of himself–Doomed Youth–which also happens to be the title of her next exhibition. In any case (no pun intended), the book is full of Justin’s baby brother’s thoughts, animal consciousness, a sort of primal spirit to the world exuding in every moment. Except at various points in the book, it felt like there were important things missing. Justin’s mother and father, for example, who seem like fairly together middle class people in a suburb of London, seem quite all right with him leaving home to live with his girlfriend, then quite all right with him going to live with the family of a friend, with lots of his strange behavior being very apparent to them. I understand parents can be quite ignorant to the fact that their children are going through very real problems, but it seems to me that these parents go beyond ignorance to something different–they seem more like absences altogether, and it not in a way that feels right. They feel like cardboard, and that the author didn’t really take the time to set up a real dynamic between them and Justin to show the reader why they care so little that he’s gone, that in fact he doesn’t even have to run away because they let him go. I feel there can be quite good reasons for this, but I’m still baffled by the end of the book why they’re such ciphers. I don’t need much to go on, but I need something. It was a glaring hole in a story that had captured me in so many other ways–imagistically, emotionally, with a quickly moving pace. I’ve never read Rosoff before, but I do know she’s known for her first novel How I Live Now, which was published as a YA novel a couple of years ago. This novel, and another novel that’s recently been released, have come out as adult, which I find interesting, because they could very well still be considered YA novels. I find this interesting because it seems there’s a blurrier line in readerships for YA/adult books these days, and, because I’m naturally curious, I wonder why that is. At the same time fantastical novels seem to be finding their way into the general fiction shelves, and I wonder if there isn’t some sort of parallel there. If there is, I’m not sure what the root of it is, but I generally like shelves full of a variety of books, rather than categories, so this is good for someone like me. But I’m sure it’s infuriating for other readers who, even if they like a variety of genres, like them to be in different sections of the bookstore so that they can find what they want more readily. As for Rosoff, I’ll be reading her other novels because I liked so much of this one. I just hope there isn’t a great absence of something important in the other novels, as a grasp on the relationship between a self-destructive, scared boy and his parents was absent in this one. Despite that, it was still a really enjoyable read. Now off to find something else to read. As mentioned in a previous entry, the city is populated with politicians and reporters at the moment, which is both interesting and creepy. On one hand, I think this region is deserving of more attention. On the other hand, it seems late in the game. But better late than never? I dunno. Maybe. Here’s an excellent piece by the New York Times about Youngstown and the political climate in Ohio. And here’s an interesting video feature from the Times, featuring my friend Phil Kidd, who runs the Defend Youngstown site. Thanks for repping, Phil! I’m in the midst of some final revisions to my next novel, so at the moment I’m sort of seeing double: the snowy, cold Midwestern winter outside my window, and then something else like this inside. Here’s a less musical and more touristy depiction of Obon. Why are they running around Youngstown and NE Ohio? Why are Obama and Clinton running around Youngstown and its surrounding suburbs like it’s the newest thing since, well, whatever–you know that saying. It’s been so strange these recent days leading up to March 4th to see so much attention being paid to this area. Part of me, frankly, wants to give any of these people the finger. Where have they been all these years, and now they come into town, look around and see that the place has potential, as Hillary said last night to a packed crowd at a local high school, though there’s also these shots you find of them in the newspaper, or that you see if you’re at these events yourself, where they seem to have a vague look of disgust on their faces–that “get me out of this dump” look that you grow accustomed to seeing on the faces of visitors who are used to living in communities with better economies. I’m torn between wanting to support someone who will actually help advocate and arrange for change in my community, because we desperately need it, and yet there is this part of me that says, “Don’t hold your breath, Chris, they want your vote, and then they’ll forget about this place, just like always.” Just like they’ve done with New Orleans, and other places that have suffered economic and natural catastrophes throughout history. When it comes to regions and cities that truly need help, I just haven’t seen any hands extended in my lifetime, and then they roll into town and tell people they’ll do this and that if they’re elected. So I voted today, because, like I said, I force myself to participate in what has, for me, been a political system that has done nothing but break the bond of trust between a people and its government for many years now. We’re products of our environment, partially at least, and since my environment is a region that has continually been used and abused by politicians for decades now, I have this instinct native to this region to not trust politicians. And yet I participate in the political process still hoping that one day, some day, one of these people who roll into town during particularly heated election periods like the one between Obama and Clinton, will actually keep their promises. I’m split between being a fool for hope and a distrusting cynic. The fool wins every time, and the cynic in me keeps on telling the fool, “When are you going to learn?” I hope one day that conversation can come to an end. Hillary will be making her third foray into town tomorrow. Obama’s got a campaign headquarters that set up shop in an empty storefront in the downtown. These streets haven’t seen so much action in a long time. So why is Youngstown and the surrounding region such a hotbed these days? 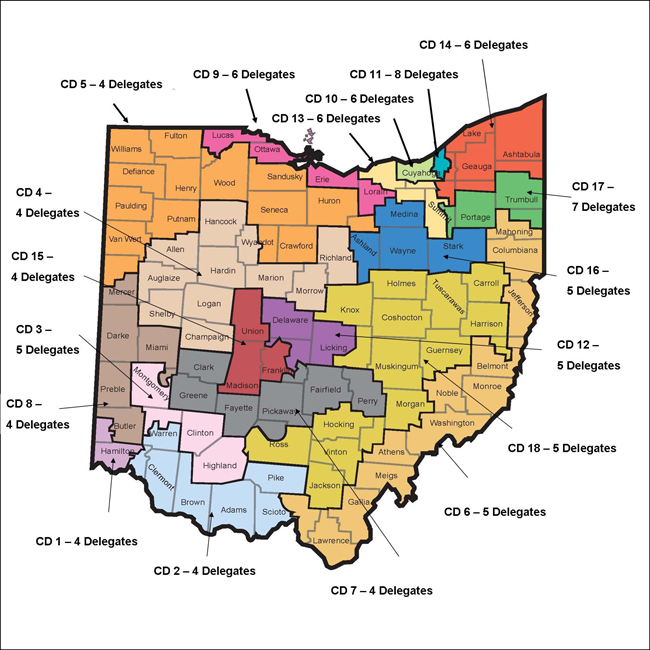 If you click on the map in the corner (via the Ohio Democratic Party) of where the delegates in Ohio are, you can see Trumbull and Mahoning Counties (in CD17) has a hefty load compared to other areas of the state. Like you said, Hilary is a strategist, and it is just so evident. I agree with you on how the president sets the tone, too, a sort of narrative for the country. But interestingly enough, yesterday I was listening to NPR and this English man living in America–a professor somewhere, at Harvard?–had a program in which he was talking about why in America we have asked for the president to do two things, and that it’s hard to get those two things in one person. In England they have the job divided into Prime Minister and Executive Chief. The Prime Minister is who sets the tone–or how this guy said, tells the story of who England is going to be while he or she’s in office. That’s the sort of thing it seems you’re talking about as what the president should do, and why Barack is better at that than Hilary. But he said the Executive Chief is the person who is the managerial type, the organizer and strategist that accompanies and executes the Prime Minister’s story for him or her. Their right hand person, so to speak. He said we expect the President of the United States to function as both of these people, and that this is our weakness because it is very difficult to get someone who is able to be both of those things–the storyteller and the manager. And I thought, wow, he’s so right! If we had a position for the Executive Chief, I would sooo say, why doesn’t Barack Obama be the president and Hilary the executive chief, because she is soooo much an executive business-y type of person. I think she would shine in a position like that, but that she has no story for her people in the storyteller position. And what America needs right now is a story, because we’ve been lost in a surreal nightmare for the past decade, (or longer, really, but I’ll just say the past decade for now) and need a story to help us become a better people. Hilary has business plans, strategies and solutions, but she has no story. Obama has the vision, the story we need so desperately. I’m sure he has flaws–some of his platforms I don’t agree with, to be honest–but he has the fire we need to wake up again, and remember how to live together. You can’t get that kind of thing from a business plan. I’d post about all this on my blog, but I’m sure it’d just attract cranks, and I’m so sick of cranks these days. But go ahead: crank if you want to.